Once again this year, on behalf of Tampa East Sertoma, I am very pleased to continue our financial support for the commendable efforts of Support Our Troops to bolster the spirit of our service men and women while deployed overseas. Your efforts will be long remembered and appreciated by those that receive the packages you send. Enclosed please find our check for $1,500 to help with postage in your mission of sending “care packages” to our troops overseas. I’m sure you’ve heard it before, but the spike in morale when your packages arrive is something that the receiving veterans will never forget – and instills a pay-it-back attitude in many when they return home to civilian life. I know that was definitely the case for me when someone received a package in my platoon as I walked the bush in Vietnam almost 50 years ago. And I still remember some of the items. Tampa East Sertoma is proud to continue providing the support we can – to keep that critically important supply line open to our veterans. You too should be proud of all that you have accomplished and continue providing. 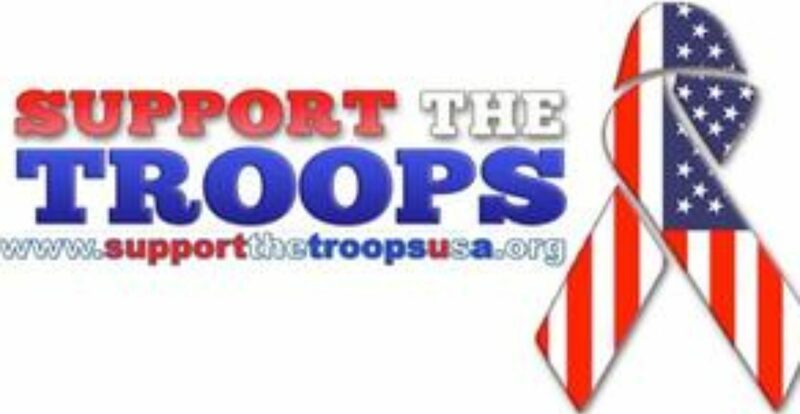 The efforts of Support the Troops Inc. are truly something to be proud of. As a long-time supporter of your organization, we appreciate your dedication to make life better for those serving in our military throughout the world. Great job. We hope you continue for many more years to continue Bob’s vision of service to our Service Men and Women while serving on foreign soil.